Work took me from Driggs over to Sun Valley and Ketchum, Idaho last week. The business part was good, plus the weather gods cooperated and it really started feeling like spring in Idaho. 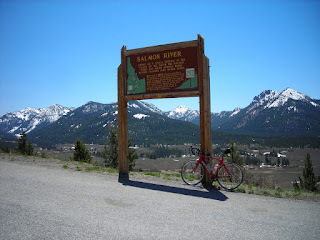 Before leaving, I took advantage and did a long bike ride I'd been dreaming about: starting in Ketchum, going north over Galena Summit (8,700 feet), down to the headwaters of the Salmon River and Smiley Creek lodge...and then back (the "and back" part is what's always tough). 74 miles, 4,400 feet of climbing and about 4.5 hours. It was an epic afternoon that I'll probably never duplicate. Perfect temperatures, sunshine, very little traffic, and calm winds. I appreciated the fortuitous timing, and soaked it all in. Mountain ranges unfolded like a delicious four-course meal: Pioneers, Boulders, White Clouds, and Sawtooths. I've spent a fair amount of time in the Sun Valley-Ketchum-Sawtooth Valley region over the years, and even remember when the Salmon runs were still productive near Redfish Lake. Even so, today was right at the top of my all-time list. 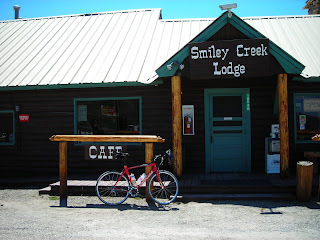 Numerous mountain bike outings with Joanne, family and friends have started and/or finished at Smiley Creek Lodge. So, it was a bit nostalgic when I wandered in solo this time to refill my water and take a break before returning to Ketchum. FYI: the Smiley Creek store is being remodeled, and will mostly be an ice cream parlor in the future. I was assured beverages and ice will still be available, and maybe a little fishing tackle. Whew. 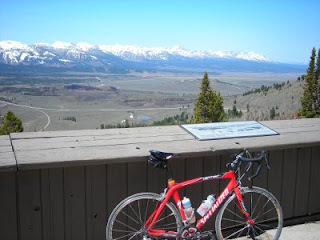 On the return ride, the aches of four-plus hours on the bike started setting in, and it was a relief to finally see the iconic Sun Valley ski area's Bald Mountain. 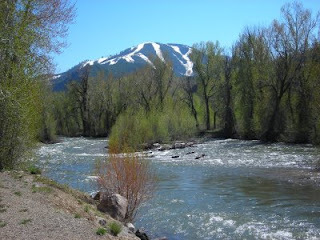 The Big Wood River is starting to rage now from area snowmelt, which prevented me from simply jumping in to cool off. It'll be a while before the water clears and the fly fishing is good, but there's plenty of work and recreation to pursue in the meantime. Happy Memorial Day!